What you are looking at is the best selling crossover/SUV in the USA. How did the Honda CR-V get there? Think about what Honda has been since making a splash with the Civic in 1972. Being an engineer and mechanic who refused to compromise and sees the larger picture, Sochiro Honda forged a philosophy of taking a basic idea and elevating it to the next level. The CVCC engine changed the way engines were designed to meet emissions standards worldwide. VTEC also took the idea of electronically controlled multi-port fuel injection and forged the balance between performance and efficiency. Components found on more expensive automobiles made their way onto Hondas. They also shifted design to distinguish run-of-the-mill cars from Honda’s own models. From these ideals came proper execution. The consumers came and fell in love with Honda’s small crossover to the point of taking deliveries at a clip of an average of 25,000 units a month in this country. In fact, our community buys more than our fair share of CR-Vs. There has to be a reason why. I drove the brand new 2015 Touring model during our first snowfall of the season to find out. The first thing you notice about the new CR-V is a combination of familiar and different elements melded together rather nicely. The grille is new for 2015, influenced by a design that began with last year’s Civic Coupe and is now seen on the latest Fit. The taillights are new versions from CR-Vs past, but everything else is all new. As visually polarizing as it might seem, it is a huge improvement from what the critics have told us about Honda design of late. As a matter of fact, I like it. In some respects, the new CR-V may seem bigger. In actuality, it is. Over time, the CR-V increased in size by various leaps, but retained its membership in a highly competitive class. It is taller, but ripe for families needing a two-row crossover with plenty of cargo space. This translates into a sizable glasshouse that helps drivers and passengers alike to see better all around. The rear quarter window’s odd shape is not much help in terms of creating a blind spot at the corners. Cargo access is aided by a huge liftgate. This comes into play for various scenarios like a trip to the home improvement store, extended vacations, and tailgating at sporting events. Lift over is low, which helps in many of these uses—especially when you put down the second row in creating enough room for a serious dose of retail therapy. Before you pick up that big item from the store, try the second row fold-down operation. Just pull the strap under the rear seat cushion, lift it toward the front seat and let the seat back just glide down into place. This is perhaps the nicest rear seat fold-down operation in the business. 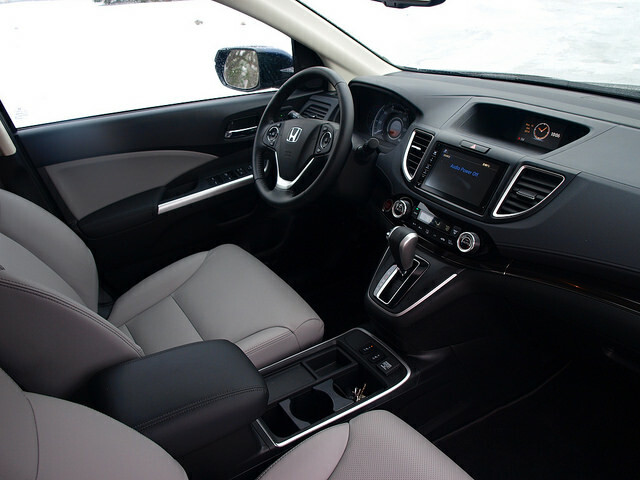 You feel the largesse of the CR-V inside with room for five adults across two rows of seating. The big front seats provide reasonable comfort and some bolstering, while the rear seats really do not need any adjustment to enjoy three-across comfort. The leather in the Touring tester is supple and soft. It is actually a great place to work in, have a meeting, or introduce new friends to your life. Normally, Honda’s interior designers usually throw a few curve balls at us. In the CR-V, they did not. The instrument panel provides a mix of upscale touches and tactile simplicity. A digital readout in the middle of the speedometer gives you all of the trip information you need. Switches and levers are good to the touch on and around the steering wheel. Some switches are hidden from view on the lower part of the left side of the instrument panel. Like most Hondas reviewed here, the Touring model came with two center screens. The upper one is the i-MID, a static display that could set up a page for time, fuel consumption, or audio playback. The lower screen is a touchscreen for audio and navigation. If you configure these screens properly, they will work. However, small navigational buttons on the left of the touchscreen could be a bit too small for some fingers. Sound from the AM/FM/SiriusXM/CD audio system is quite good. You get 328 watts of sound through seven speakers, the seventh being a subwoofer. A Bluetooth-compatible phone works well with both phone functions and streaming audio from your song files. There is a provision for you to stream your Pandora channels through these seven speakers. 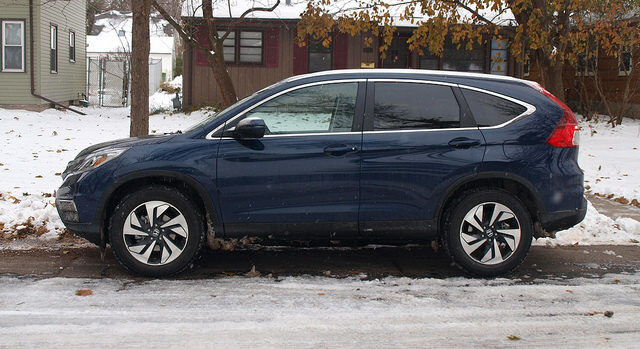 Honda stuck to a single engine lineup for the CR-V, something you rarely see in the compact crossover segment. The 185 horsepower 2.4-liter Earth Dreams engine offers strong delivery and balanced cruising. It can get a bit noisy when the throttle is pushed hard, but it does quiet down when it settles into its groove. It is mated to a brand-new Continuously Variable Transmission and Honda’s Real Time all-wheel drive system. To make things more efficient to run, there’s the Eco Assist button to depress. That changes the timing and gearing to induce more efficiency from the driveline. Honda makes some very good drivelines that are smooth to operate and easy to manage. The CR-V’s set up meets those expectations just fine. One thing to understand about the CR-V is its mission: to haul families. One does not expect a CR-V to race on Sunday or dodge the crazies on the highway. Therefore, its main tenet is a supple ride that does not offend anyone sitting inside of its huge cabin. When presented with a pothole or any deep road imperfection, the suspension does its best to soften the shock. You do feel that pothole, however. A supple ride should be balanced with good handling. 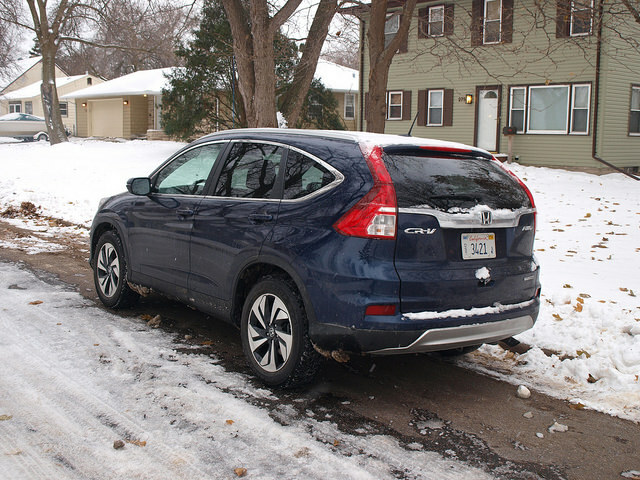 The CR-V handles quite competently in both normal and evasive situations. However, there is plenty of body roll through the curves and corners. The brakes felt as though they were improved from previous CR-Vs with a solid feel for normal, panic, and winter stops; however, I found the brake pedal too close to the accelerator. That is a potential safety issue. Speaking of safety, the Touring model adds several features for the first time on the CR-V. This includes a collision mitigation braking system and lane departure warning with the lane keeping assist system—all very useful for a crossover/SUV. Active cruise control is another feature exclusive to the Touring as a very welcomed feature on the CR-V.
One thing I look for in a crossover/SUV is fuel economy. There are cases when a certain consumption number is deemed acceptable. Some consumers would rather hit the estimated highway number all of the time. Let’s be realistic—you won’t. The good news is that the CR-V came in with an average fuel consumption figure of 24.4 MPG. In my book, that’s a good realistic average for a two-row, four-cylinder crossover/SUV in the CR-V’s class. Then, there’s the bottom line. A good crossover/SUV has to be good value for the money. The CR-V lineup starts with a front-drive LX model at $23,320. Our top-of-the-line Touring model with all-wheel drive model came out to $33,650. Rarely do we celebrate a crossover with good value and a huge cabin. The Honda CR-V is worth celebrating. The CR-V is a mainstream choice in a highly competitive marketplace. One would have to look around to see why. Not just the latest models; all four generations of CR-Vs. That should tell you how mainstream and popular this model has become. Somehow, Motor Trend magazine agreed. They named the revised CR-V their SUV of The Year. 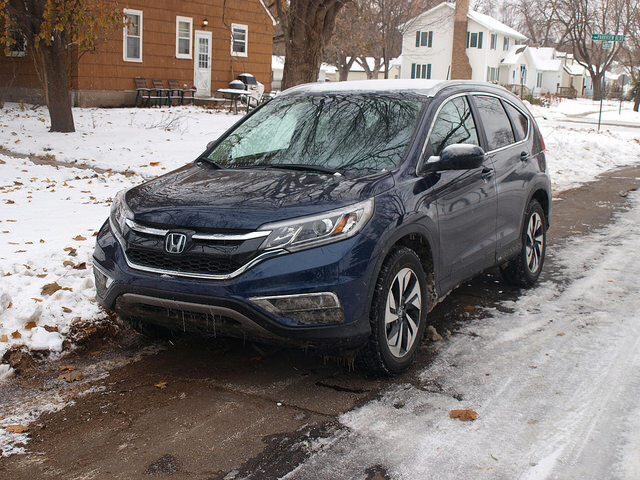 The new CR-V is a very comfortable, capable, and competent crossover/SUV for today’s consumer. Compared to what I have driven over the past few years, the CR-V is a very solid choice to make.